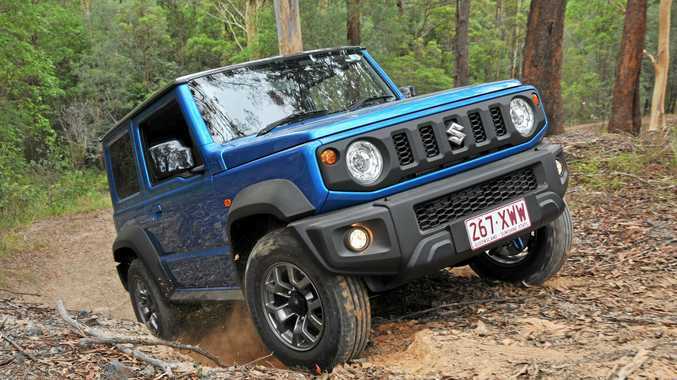 Suzuki has just launch the 2019 model Jimny. REMAKES are seemingly all the rage. Filmmakers bereft of inspiration head into the archives to reincarnate the classics. Modern interpretations don't always enjoy success - we're looking at you Point Break circa 2015 and Footloose in 2011 - but Suzuki has proven you can breathe new life into a legend without ruining its legacy. 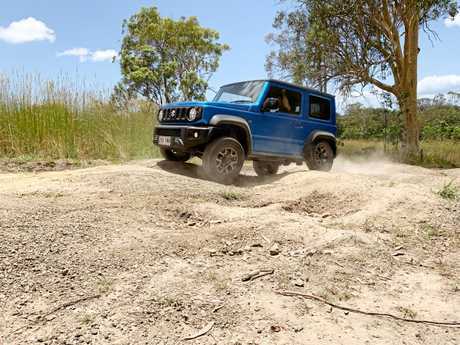 The Jimny has developed a cult following over decades, yet this retro resurrection has found favour with the faithful and a new legion of fans. Maintaining the quintessential styling, it also maintains old-school ladder frame construction mixed with modern conveniences. Best of all there's no hefty premium when it comes to price. Starting from $23,990 plus on-roads for the manual version, this is the range-topper. Add $2000 for the auto. A cut-price GL with less features is expected to arrive at some stage in the near future which will bring the total closer to $20,000, but the current offer has already seen buyers clamouring with the order bank extending to November. 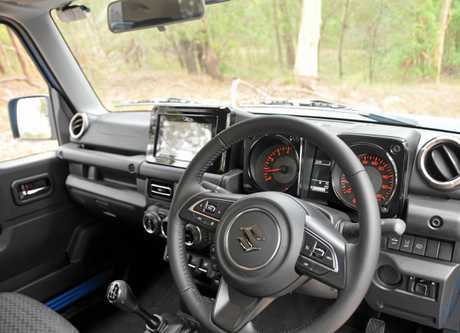 Typical Suzuki plastics adorn the dash and doors, with the attention-grabbing inclusion of a seven-inch infotainment screen with Apple CarPlay and Android Auto connectivity stealing the attention from an otherwise basic cabin. With a black colour scheme the driver has two analogue gauges, a tacho and speedo, while sitting in the middle is a 2.5-inch monochrome display which provides details like trip distance, distance to empty and fuel consumption. Other standard gear includes a leather-wrapped steering wheel (which only has vertical adjustment, no reach), aircon and USB charging point. Nothing about the Jimny is complicated. The colour palette is no different with just four options. White is the only choice which doesn't attract a premium. For an extra $500 there is 'jungle green', while there are a pair of two tone options for $1250; yellow with a black roof or blue-black. Meeting the market, Suzuki has extended its warranty coverage to five years or 140,000km but that's conditional on maintaining capped-price dealer servicing. Otherwise the coverage remains at three years. Servicing is required every six months or 10,000km, which is short compared to the annual intervals on most competitors. The cost of servicing for five years is $2912, and Suzuki covers most consumables which means you won't be up for too many unforeseen extras. Gaining a three-star safety rating, the Jimny does have automatic emergency braking which Suzuki calls dual sensor brake support. It applies the anchors if a frontal collision is detected and the driver doesn't react quick enough. Lane departure and weaving warning is also standard ... the steering wheel vibrates and an alert sounds if the driver wanders. Crash authority ANCAP was critical of the Jimny's protection for those outside the vehicle, primarily pedestrians and cyclists, while there was also concern over the loss of structural integrity in the frontal offset test. That said, it achieved 73 per cent adult occupant protection and 84 per cent for children. Rear parking sensors are an optional extra but they are not available on the front. Highway driving isn't the Jimny's forte. Pushing 3500pm at 110kmh, it's working hard and the road noise is palpable. Yet slow things down and the diminutive four-wheel drive struts its stuff with a swagger to rival John Travolta in Saturday Night Fever. 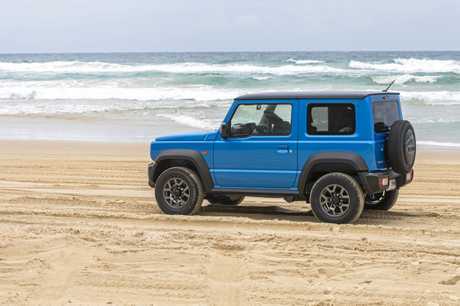 Boasting a turning circle of less than 10 metres, it's one of the easiest cars to park on the market aided by compact dimensions - the Jimny is just 3645mm from bumper to the rear-hinged spare on the back door and 1645mm wide (not including the side mirrors). Short overhangs front and back make tight urban car parks a cinch even without parking sensors. You do need fast hands, though, as it takes a few turns lock-to-lock. The stubby design works wonders in the bush. Despite having just 210mm of ground clearance, that short wheelbase combined with the compact dimensions deliver off-road brilliance. Beach work offers no challenge and tipping the scales at just 1110kg means its feather-like across the sand. Shifting from two-wheel drive into four-wheel drive high or low is done by a familiar separate small shifter near the hand brake - what's old is new again. 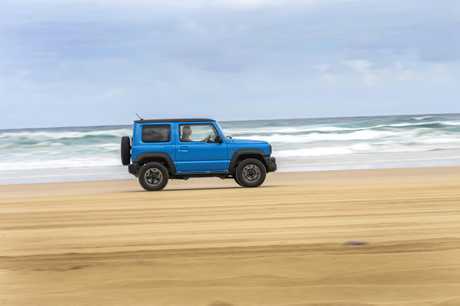 One new function in the Jimny is "limited slip drive” which in slippery conditions applies brakes to the wheels which lose traction. Power is then sent to the wheels which have grip enabling the driver to crawl out of just about all challenges. While reaping the rewards of its compact dimensions when off-roading or blazing through traffic around town, there is little room to move. Boot space is compromised, about 80 litres with the rear seats in use. A full grocery shop with the kids is out of the question as the rear seats need to be folded to have a meaningful load space. There are limited spots for phones and keys, and the dual cupholders are set back between the two front seats. Operationally everything is simple, with basic aircon, cruise control functions on the steering wheel and the stereo system all intuitive. The latter is aided by the smartphone mirroring apps - surprisingly the sound quality is good talking on the phone even when the Jimny is at its nosiest on the highway. 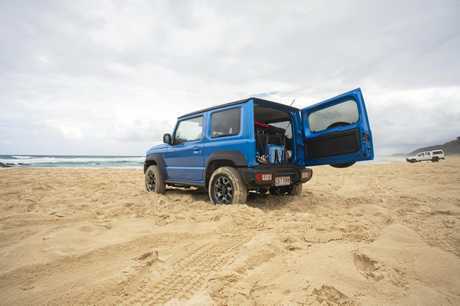 Powered by a gutsier 129kW/230Nm 2.4-litre 4-cyl engine, it also oozes retro cool but at a much higher price. Feels solid with off-road specific tech, including Jeep's Selec-terrain with low range, hill descent control, underbody skid plates, tow hooks, as well as a 6.5-inch colour screen and 351 litres of cargo space. Doesn't have the same off-road prowess as the Jimny, but it's a groovy looker (depending on your tastes) with a 140kW/240Nm 1.6-litre 4-cyl engine. Comes with some good kit for the coin, like leather trim, heated front seats, six-speaker stereo and 360-degree view camera.